The game market is growing up every year. And many players want to broadcast their favorite games for a wide audience. 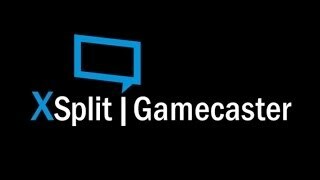 XSplit Gamecaster is a powerful tool for game streaming. This program allows you to create broadcasts on Twitch, Hitbox, Azubu, and other streaming services. Of course, modern games are required computers that show high performance. 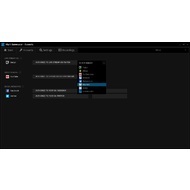 The application can capture video stream from a webcam or capture card. The last one allows you to stream console games. The program can also record video files. At first, you should create an account and confirm it by email. After launching you will see the ad screen of the premium account. Just wait a few seconds and skip it. 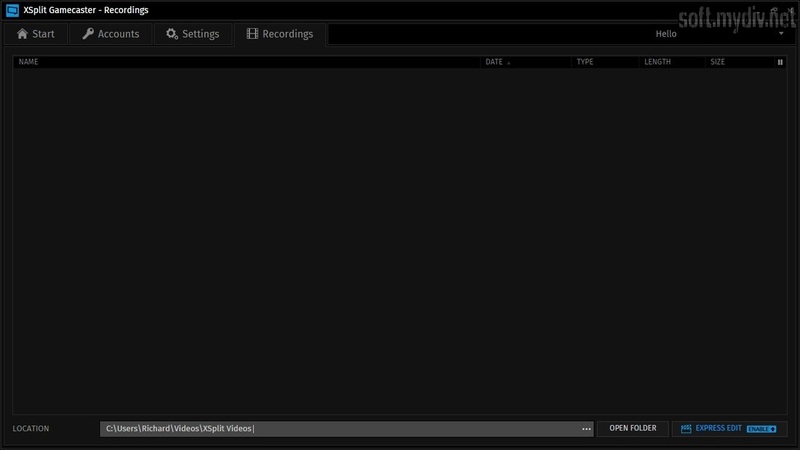 The interface and color theme are similar to XSplit Broadcaster utility. The program has the detailed guide and videos how to create a broadcast in 3 steps. There are four tabs on the top menu: Start, Accounts, Settings, and Recordings. 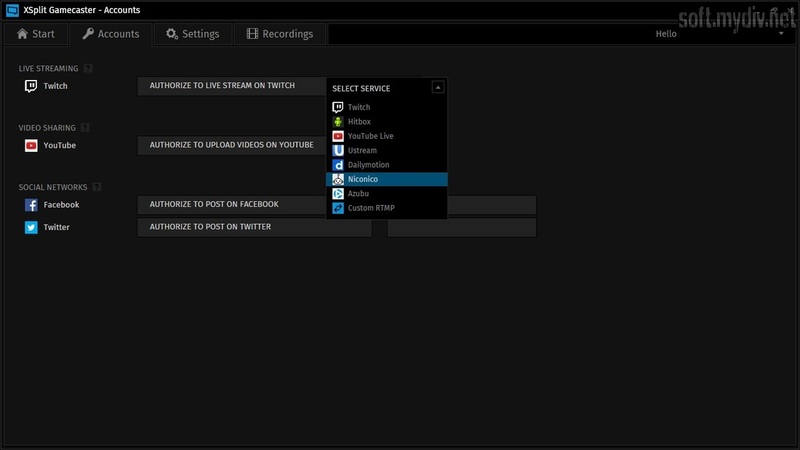 To start broadcasting, you need to open Accounts and attach your created account to your streaming service channel. 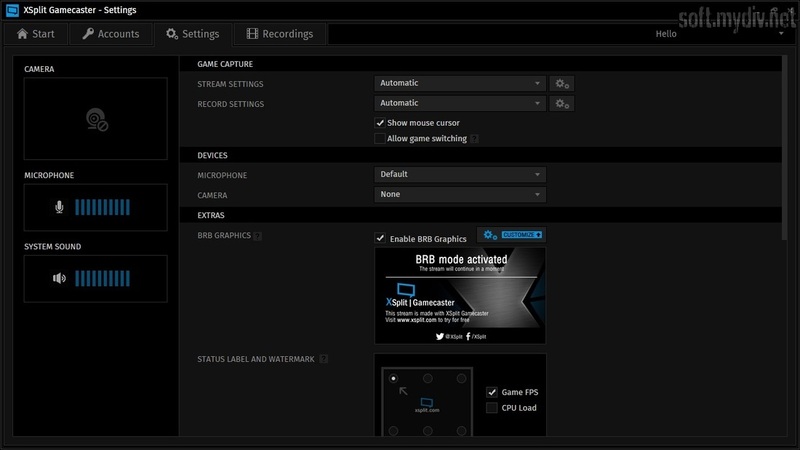 The Settings menu allows you to control a camera, microphone, and other stream preferences. Also, you can assign hotkeys and change video bitrate, frame rate, stream delay, and codecs. Despite there are no time limitations, there are some functional restrictions for the free version. If you want to remove them, you should upgrade the program. 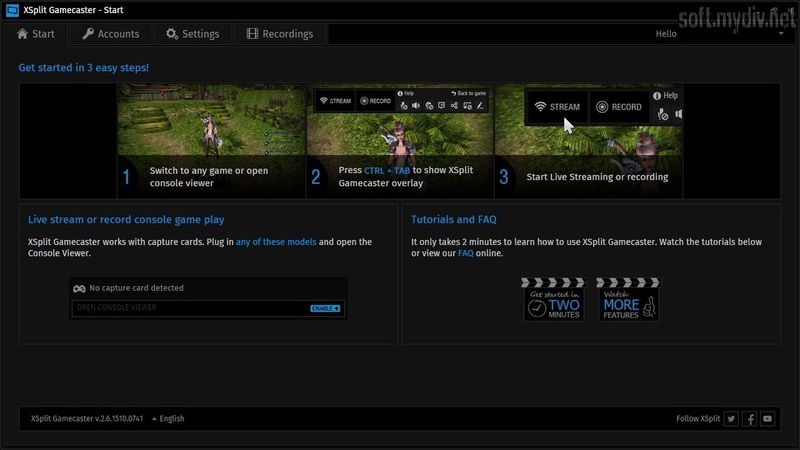 XSplit Gamecaster is a simple and convenient software for live streaming. It is easy in use and provides a lot of useful features. The utility has support for popular streaming services, as Twitch, Hitbox, Dailymotion, YouTube Live, Azubu, and others. The program can define a chroma key from a webcam. It has support for plugins, which can extend the functionality. It doesn't allow to stream for a capture card. There is no support for the Twitch chat. The advertisement screen after launching. There is no RGB setting. Core i5 / i7 CPU. GeForce or Radeon class video card with DirectX 10.1 support. NET Framework 3.5 or 4.0. Adobe Flash Player for Internet Explorer. Added support for Personify ChromaCam for Logitech C922. Support IME input in overlay. Fixed an issue with streaming to EvoStream, Joistream, or Switchboard live. The collection of best applications for video streaming.